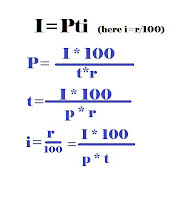 Shortcut formula for Simple and compound interest math chapter for competitive exam. 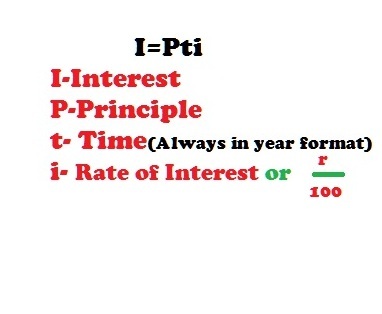 Simple interest is an important and interesting Arithmetic chapter for all competitive examinations. Banking examiner asks several questions from this chapter, if you follow any question where Mathematics has enlisted as the part of the syllabus, obviously, asked two or more questions from the simple and compound interest math chapter. One thing more that this chapter is very easy if you memorize one formula. Because this formula is on an equation and you can make other formulas on the basis of this equation. Before moving to aptitude and the shortcuts formula of Simple and Compound Interest, we should have a basic concept. That is below. Interest: - Interest is the extra money, which gives for using their money for a certain period. 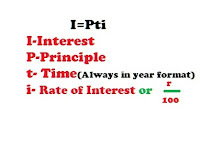 The rate of Interest: - Rate of Interest usually symbolized as R%. 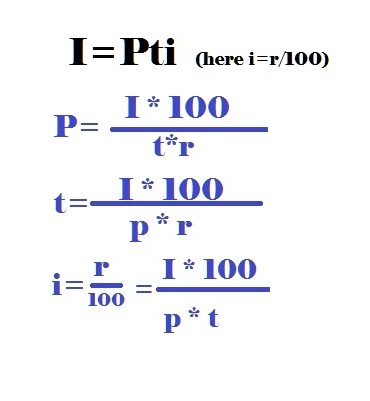 That’s means R unit per hundred. Principle: - Principle is the money which customer borrowed from the bank or keep in the bank for a certain period. Above equation is the heart and soul formula for the Simple Interest aptitude. We can solve basic aptitude from this chapter by this equation because we can also able to make other formulas on the basis of this equation. For the competitive math. Let's see other formulas which are created depending on above equation. We should learn more advanced and shortcuts formula for the Simple and compound interest math chapter for our competitive examination. We have just told the basic formula of simple Interest math chapter. Below, providing few more essential and tricky simple interest formula for quick math solution of simple interest problems. Math Tricks 3: The principle became X with the interest if the were r% per anum, then find the time value in years? In next tutorial of simple interest solved aptitude, we will solve some aptitude in the quick methods using mentioned math tricks- from simple to exam level.After then we will give you few more aptitude tricks of Simple interest in the 3rd tutorial. Hope you will read next tutorial on simple interest math tricks.